Our generation is not alone in finding it difficult to appreciate the spiritual significance of the human body. Across the centuries, an abiding temptation for many is to believe that physical things simply cannot become holy. Of course, that perspective often serves as an excuse to justify living as we please in daily life while giving God only our thoughts and feelings. Whatever such a spiritual path may be, it is not the genuine Christian faith and lacks the power to heal us as the whole persons God created us to be. 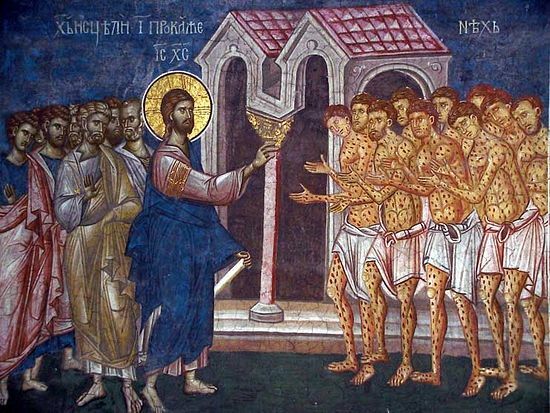 Today’s gospel passage describes our Lord healing ten men who suffered from the dreaded disease of leprosy. Christ’s healing ministry showed that His salvation encompasses every dimension of the human being: body, soul, and spirit. He demonstrated how His gracious love restores broken, weak people to their dignity in the image and likeness of God. Were our bodies spiritually irrelevant, intrinsically evil, or otherwise not integral dimensions of who we are, the Savior would surely not have devoted Himself to blessing the sick. But since we are creatures of flesh and blood in a world of death and decay, He restored people to health as an enacted icon of His gracious purposes for us all. For He did not come merely to teach or even to forgive, but to restore and fulfill us as sons and daughters who truly share in His eternal life. He came to heal us in every way possible. Perhaps we have heard stories of the Lord’s healing mercy so many times that we take them for granted. Today’s particular account has a couple of details that should focus our attention. 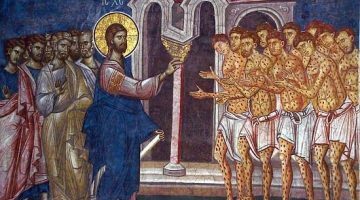 First, the men whom Christ healed had leprosy, a dreaded disease that separated its victims from anyone who did not have it. Notice that the men stood at a distance when they called out for healing, for they were considered dangerously unclean. Here we have a sign of how easily our sins can separate us from others, including those we love the most in this life. We may become overwhelmed with guilt and shame to the point that we would rather withdraw from relationships than confront the painful truth of how we have harmed them. Unless we embrace the healing of Christ, the causes of our separation from one another will simply fester and weaken all concerned. If He could cleanse people of leprosy and restore them to a normal life in first-century Palestine, we must not place limits on how He can heal us and our broken relationships today. For that to happen, we must respond to Him with the humble faith of the Samaritan leper. This is the second noteworthy detail: The only one of the lepers who returned to thank Christ for healing him was a hated Samaritan, considered a foreigner and a heretic by the Jews. After the man fell down before Him in gratitude, the Lord said, “Rise and go your way; your faith has made you well.” This shocking detail reminds us that the Savior’s therapeutic ministry extended to those very much on the margins of society, to those outside the class of people considered neighbors. Because He came to bring all people and the entire creation into the blessedness of the Kingdom of God, however, Christ’s mercy for suffering humanity extended also to him. The Samaritan’s physical and social disability were signs of his need for healing and restoration that he could not give himself. Out of deep gratitude for this completely unexpected and shocking blessing, the Samaritan alone returned to give thanks. Consequently, he was healed that day in a way that extended beyond the merely physical. His example should remind us of the importance of expressing gratitude to the Lord for His mercy and of extending that same mercy to the suffering people we are tempted to view as strangers and enemies. Saint Paul knew that even a great apostle received the healing of Christ like an earthen vessel, like a container made of clay. The great “transcendent power belongs to God and not to us,” for we are weak in so many ways. He writes of “carrying in the body the death of Jesus, so that the life of Jesus may be manifested in our bodies. While we live we are always being given up to death for Jesus’ sake, so that the life of Jesus may be manifested in our mortal flesh.” Through his many sufferings as an apostle, Saint Paul became a living icon of the Savior’s victory over corruption in all its forms, including the grave. By enduring abuse, imprisonment, and ultimately martyrdom, he gave testimony with his own flesh and blood to the One Who both rose from the dead and shares His eternal life with those who unite themselves to Him in humble faith. By such a ministry, St. Paul became an instrument for others to receive grace and give thanks to God. The apostle’s teaching and example remind us of the necessary place of the body for the healing of our souls. We celebrated at Christmas the birth of our Lord as a human infant with the same physical characteristics as any other baby. He had to become fully one of us in order to fulfill our vocation to become like Him in holiness as “partakers of the divine nature” by grace. We commemorated His baptism at Theophany, for His physical immersion in the Jordan restored the entire creation to holiness and was the occasion for the revelation of the Holy Trinity. As those who have been baptized into Christ’s death, we have died to sin and risen up with Him into a new life of holiness. (Rom. 6:3-4) It is simply impossible for us to respond faithfully to this high calling in a way that is somehow separate from our actions each day in our own flesh and blood. There are different callings in life that point us on distinct pathways to the Kingdom. Today we commemorate St. Euthymios the Great, an exemplary monastic who worked miracles, embraced rigorous asceticism, taught and led others wisely, and defended the Orthodox faith. Much discipline and self-denial are required for such a way of life, for so many desires are rooted deeply within us and disoriented by our self-centeredness. It would be a grave error, however, to think that only monks and nuns should undertake such struggles. For example, to shut our eyes and ears when media and entertainment threaten to inflame our passions for sexual pleasure and hatred toward real or imagined enemies is a necessary form of spiritual vigilance for people in our culture today. To fast moderately serves the health of our souls and our bodies, as it gives us strength in controlling our desires for immediate satisfaction on our own terms. And limiting our self-indulgence in food and drink just a bit should free up resources to give to the poor and needy in whom we encounter the Lord. Since we are earthen vessels, we are weak and unworthy of the promise of healing that is ours in Jesus Christ. That is why we must attend to how we are offering ourselves to Him practically so that we may gain the strength to turn away from everything that hinders us from sharing in His life as fully as possible. We cannot separate our bodies from our souls; and in light of our Lord’s birth and baptism, the physical dimensions of life certainly do not have to separate us from Him. Recall that through His healing of people suffering with leprosy, a Samaritan became an example of faith and gratitude. Through the offering of the Eucharist, bread and wine become the Body and Blood of Christ. Through the blessing of holy matrimony, the intimate relationship of man and woman is oriented toward the Kingdom as husband and wife become an icon of the relationship between Christ and the Church. The Savior comes to heal us all in every dimension of our life as embodied persons who bear the divine image and likeness. Remembering that we are flesh and blood, let us fall down before Him in thanks as we accept this great blessing for the healing of every dimension of our humanity: body, soul, and spirit.